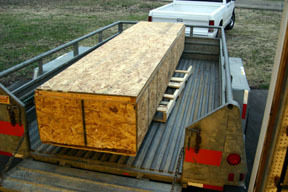 After gestating in Robert Baslee's shop for about six weeks, a 12' long crate arrived at my local freight terminal. I elected to take delivery at the terminal instead of having to arrange meeting a driver at home. I also needed a means to transfer the 530 lb crate to the shop. 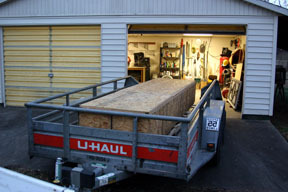 A 12' U-Haul utility trailer was the ticket for getting the kit home and into the shop. Removal of a couple handful of screws from the particle board lid revealed an interesting assortment of......stuff. 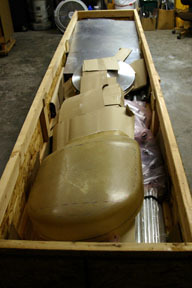 Easily identified were wheels, wheel covers, cowl nose bowl and a document package. But the real bones of the kit were apparent after digging deeper into the box. 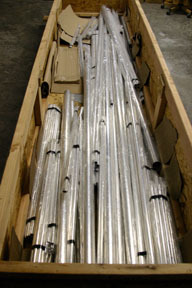 Dozens and dozens of aluminum tubes comprised the majority of the shipment. There were several large plastic bags which were labeled for individual sub-kits and contained gussets, hardware, fittings, etc. Fortunately, every item was tagged with a sticker bearing a code number specifying the sub-kit the part belonged. The first evening was spent exploring the document package which includes a build manual, a set of drawings, and two CDs with photographs and video. Surprisingly absent from the package was a materials list with which to verify the shipment was complete. I suspect this is to protect proprietary data to discourage someone from "kitting" an unauthorized project. It would be possible to make a detailed inventory by picking apart each drawing and matching it with the pile of parts, but I decided my time was better spent elsewhere. Guess in the mean-time we'll just have to trust the mothership that we have a complete kit. Update 3/24/2015: There have been a few instances of missing or mis-labeled components. These have not caused construction to come to a halt but are usually not discovered until the parts are needed. Airdrome Aeroplane has been reliable about sending the missing items. 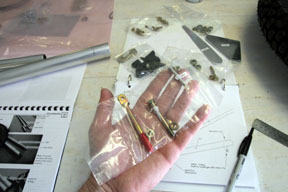 The method of organization of the kit is to divide it into subkits. Each subkit is bagged separately and individual parts are tagged and bagged. 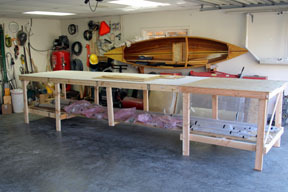 It had been four years since the last aircraft project so I had to make new benches and gather all the airplane tools. Here is where used kit shipping crates go to live another life. The crate was cannibalized along with some fresh materials to build two 4' x 4' tables. An 8' leaf is bolted between them to yield a 4' x 16' work space. 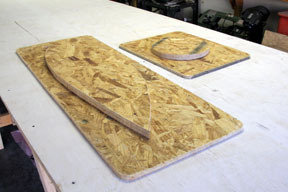 After the fuse is built the tables can be separated into different configurations as needed. There was enough crate material to make a storage shelf under the bench for the kit presently under construction. 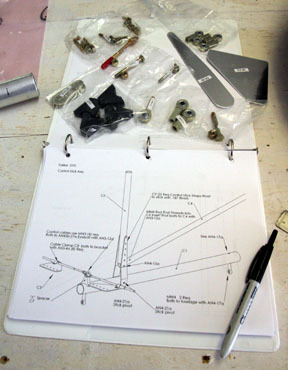 Patterns are included in the doc package for a bending fixture. I added another on that is 14" in diameter. These were built out of....crate materials. Time to start making the stuff in the crate look like a Fokker.